The Boston Leather FDNY Style Leather Radio Straps have always been a great selling product because they're useful, well made, and totally durable. You guys love them! Now we're offering the Leather Radio Straps with Reflective Trim to just take it over the top, and give it that extra safety boost. 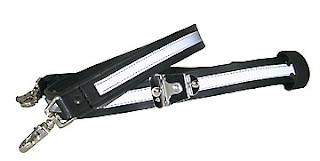 The straps are 1 1/4" heavy duty leather with 1/2" reflective trim, that not only looks cool but keeps you safe and seen. The Radio Strap feature a Motorola hang-up clip instead of a leather mic loop, with a positive locking buckle. This strap can mate to a radio holder with it's rust free scissor snaps! The strap measures 53-62 (adjustable) inches in length from clip to clip. It pairs with our awesome radio cases, options a plenty. Our universal radio cases can be found right here and the custom radio cases can be found on our website here. To read more about the New Reflective Boston Leather Radio Straps or get yours today, click here.